The powerful collision between two asteroids in the inner main asteroid belt 160 million years ago was the likely source of the K-T impact 65 million years ago that ended the Age of Dinosaurs. The dinosaurs never had a chance: A powerful asteroid collision that occurred millions of years before the dinosaurs even evolved on Earth was the likely source of the meteoric impact that ultimately killed them, a new study reports. The collision occurred within the inner main asteroid belt, located between the orbits of Mars and Jupiter, says William Bottke, a planetary scientist at the Southwest Research Institute in Boulder, Colo. Over the last few years, many new asteroids have been identified within the belt, thanks to an increasing number of asteroid surveys around the world that have created a rich data set to study, Bottke says. His team was investigating a recently discovered cluster of asteroids within a remote part of the belt, centered around a large, well-known asteroid called 298 Baptistina, and didn't "set out to solve [the] mystery" of what killed the dinosaurs, Bottke says  but what they observed of the asteroid cluster was "immediately exciting," he says. The cluster showed signs of being the result of a large breakup event, with a curious hole within the breakup "family" where even more asteroids ought to have been. Furthermore, this family of asteroids happened to be very close to an "escape hatch," a part of the asteroid belt that is strongly influenced by the gravitational pulls of Jupiter and Mars. Those gravitational forces can thrust objects out of the asteroid belt, possibly sending them into a new, Earth-crossing orbit. Those observations were particularly exciting, Bottke says, because they suggested that such a breakup event within the asteroid belt might allow numerous fragments to reach orbits where they could have a significant impact on Earth, the moon, and the other inner planets. To study what might have actually happened in the cluster, Bottke's team ran a series of numerical models, collecting data on the orbital elements of all of the current objects in the cluster to determine which pieces were part of the same "family," possessing orbits very similar to each other. Working backward and comparing the number, size and movement of the pieces in the family with the results of numerous asteroid movement and impact simulations, his team determined that 160 million years ago, an asteroid 170 kilometers across had collided powerfully with another asteroid about 60 kilometers across to form the current cluster of asteroid fragments  and in the process, propelled other fragments out of the belt altogether and into the escape hatch, the team reported today in Nature. That time frame corresponds well with an increased meteor impact rate (as evidenced by the number of craters) on Earth and the moon over the past 100 million years, Bottke says. The biggest fragment of the asteroid family would have been about 10 kilometers in diameter, he says. "Right away, we thought, what's the biggest impact on Earth since that breakup took place? Immediately, we thought of the K-T impact" that ended the Cretaceous Period (and the Age of Dinosaurs) and heralded the start of the Tertiary Period, he says. That impact was likely to have created the Chicxulub crater in Yucatan, Mexico, which was produced by about a 10-kilometer asteroid. To pinpoint the K-T impact to that asteroid collision, however, required additional evidence. Geochemical evidence, including chromium isotopic data and data from rare elements in the platinum group, suggests that the Chicxulub impact was formed by a type of asteroid called a CM carbonaceous chondrite that is relatively rare on Earth, says Philippe Claeys, a planetary geologist at Vrije Universiteit Brussel in Brussels, Belgium who was not involved with the study. Most impacts on Earth have occurred from ordinary stony meteorites known as chondrites, but carbonaceous chondrites "are primitive meteorites that did not undergo any evolution" and resemble the original composition of the solar system, so they are compositionally distinct, Claeys says. Spectroscopic evidence of 298 Baptistina, still orbiting in the inner asteroid belt, shows that it, too, is a carbonaceous chondrite. 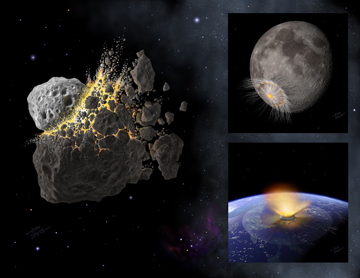 Based on this evidence and the relative abundance of projectiles from the Baptistina family compared with other background meteors, the likelihood that the Chicxulub crater was caused by one of the Baptistina pieces is about 90 percent, Bottke says. What his study suggests, he says, is that events that happen in the asteroid belt "can have a pronounced impact on Earth, on the biological and possibly even geological history of the planet." Furthermore, he notes, it may ultimately be possible to link other events in the planet's history  or on other bodies in the inner solar system, such as the moon and Mars  to asteroids' influence. Bottke's findings are "a remarkable piece of work," Claeys says. By basing the work initially on observations and deriving models from those, he came up with a "great idea and some very good arguments to back it up," he says. Actual compositional data from samples of 298 Baptistina that might confirm that it is a carbonaceous chondrite, and the discovery of other, much smaller carbonaceous chondrite impacts from around the same time period would make the case even stronger, he says. The new study, however, suggests that such "asteroid showers are possible" and can have an enormous impact on Earth, Claeys says  and also suggests that scientists have much more to learn about the "huge and dangerous game of billiards" continuously underway just outside Mars' orbit.